WELCOME TO THE SUMMER OF PERMA!!!! Are you ready? Are you excited? Hmm . . . I’m guessing no. I’m guessing you’re probably confused. Let me back up — waaaaay up. Before you can understand the summer of PERMA, you’ll need a little context about the philosophy of What’s Your Grief when it comes to coping. And for that you need to know a little bit about us. Here at WYG there are some things we love and some things we don’t love that will set the stage. 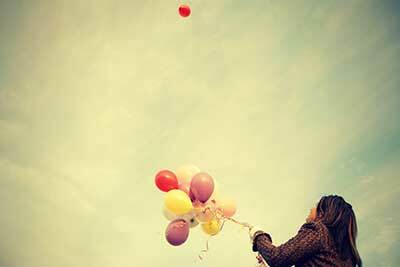 With these lists in mind, some people are surprised that we are fans of positive psychology. They think two down-to-earth, realist gals who don’t sugarcoat grief couldn’t possibly like a school of thought that is all about positivity. This is usually because many people have an overly simplistic view of what positive psychology is all about. They think it is a bunch of self-help hooey that is nothing more than saying if you think positively all of life’s problems will magically disappear. But we promise, that’s not what it is all about. Positive psychology doesn’t deny that life can be brutal, unfair, chaotic, devastating, and generally crappy sometimes. It doesn’t insist that the only difference between a good day and a bad day is your attitude. It does provide some real, evidence-based tips and strategies to help you cope even when life is . . . well, life. And, as you may have noted, figuring out realistic ways to cope is squarely on the list of things we like. 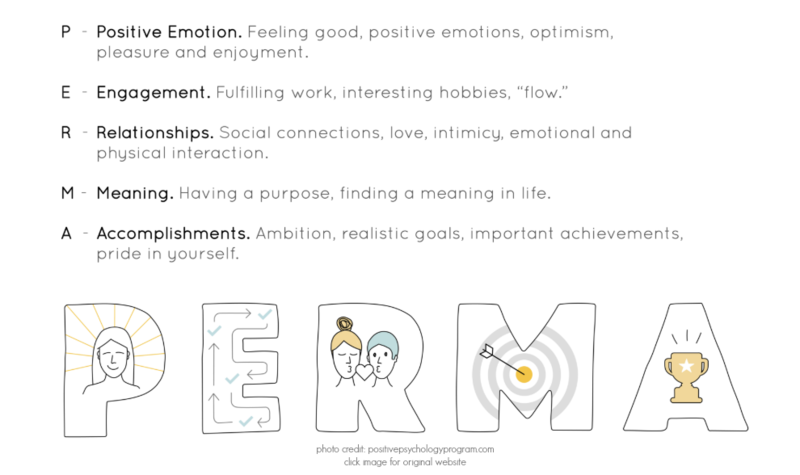 One well-researched concept in positive psychology is the concept of PERMA, introduced by Martin Seligman. Seligman suggested that there are 5 dimensions of psychological well-being and, by tending to each element, individuals can improve their overall sense of happiness, fulfillment, and well-being. The areas he identified and researched were Positive emotion, Engagement, Relationships, Meaning, and Accomplishment. You can (and should) read Eleanor’s post with more info details about each aspect here, you can read even more at this positive psychology website, and if you want to check out his book it is called Flourish: a visionary new understanding of happiness and well-being. Hmmm . . . wait. Nevermind. Not yet. 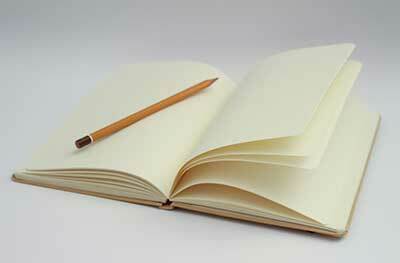 First, we should do a quick recap of our thoughts about coping. First, we are strong believers in coping with grief (we’ll call that loss-oriented coping). We’re strong believers in coping in general (we’ll call that well-being coping). We think that grief researchers like Stroebe and Schut got it right when they suggested that coping with grief means tending to loss coping, restoration coping, and taking a break sometimes. We’ve written tons about coping, so you can read more about it here and more about creative coping here. But the core of what you need to know is that sometimes things that aren’t loss-oriented coping specifically are still helping you cope with grief. They are helping to boost your overall well-being, they are helping you take breaks and space, they are helping you with the ‘restoration-oriented’ things that are important to your overall well-being and that make it easier to do the loss-oriented coping. For more details, make sure to check out Eleanor’s very helpful post about this balanced coping method here. Okay, back to THE SUMMER OF PERMA. Really this time. With Memorial Day behind us and the last day of school approaching, Eleanor and I were sitting around the other day talking about the summer. We were talking about goals and general WYG tasks. We were talking about some personal life ups and downs, grief related and otherwise. We made a decision at that moment that we are going to challenge ourselves to do one thing every day that contributes to our overall well-being. One thing, however small, every day. Now, those of you who have been long-time readers know that Eleanor and I are notorious failures when it comes to challenges. 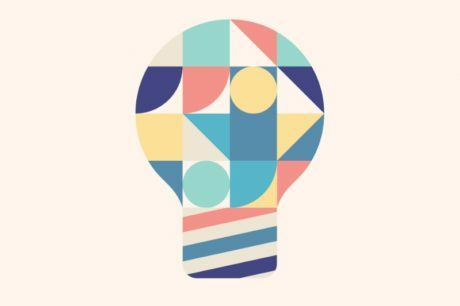 Photo challenges, gratitude challenges, you name it, we’ve tried and failed. But guess what? We keep trying. Why? Because we are gluttons for punishment. Because the WYG community keeps us determined and motivated. Even when we don’t manage our ambitious, daily challenge goals, we still start doing a lot more of a positive thing than we were doing before. We get excited and inspired when we see all of the readers and social media followers who are doing the challenge along with us. We remind ourselves that coping isn’t about doing things perfectly, it is just about doing things. Occassionally it is about doing big things. Sometimes it is about doing small things. Often it is about doing tiny things. And sometimes it is about making half-assed attempts to do tiny things when you can barely leave the couch, but still finding a way to be proud of yourself for trying. So here it is, the latest WYG challenge: THE SUMMER OF PERMA (you don’t always have to type it in all caps, but it really increases the dramatic effect when you do). Starting TODAY Eleanor and I will be doing one thing each day that contributes to our PERMA. 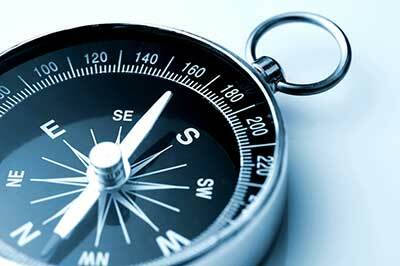 The beauty (and challenge) of PERMA is that you have to find what works for you. We will be doing our best to share what we are doing on facebook, instagram, and twitter. We have an infographic to get you started with some ideas. 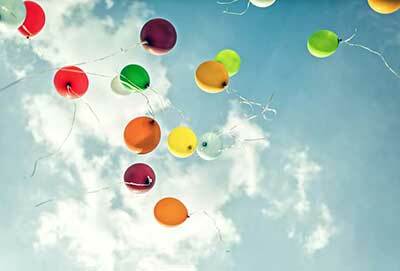 You can check out this great list of 100 small things to increase joy. We also have this printable PERMA worksheet where you can brainstorm your own ideas of what will increase your PERMA and use it to check things off this summer You might not manage something every day (let’s be real, it will be a coup if Eleanor and I manage that) but it is a great goal, and something is always better than nothing. You don’t have to share what you’re doing, but we would love it if you do! 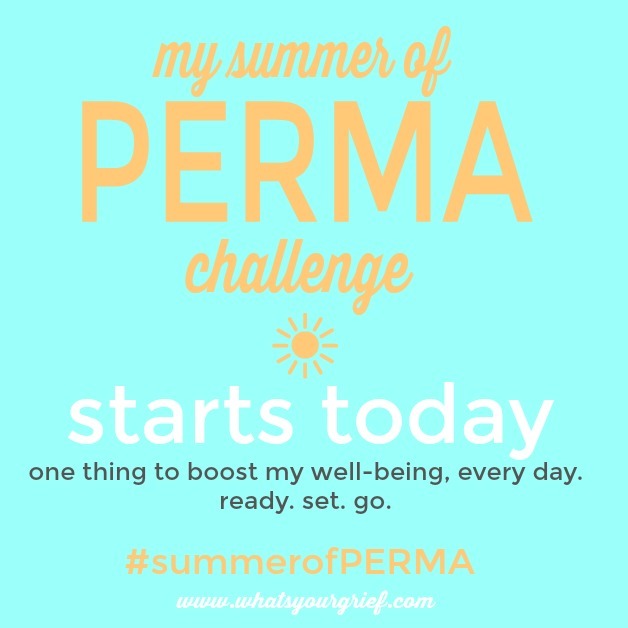 Hashtag your posts on instagram, facebook, or twitter with #summerofPERMA. We’ll follow the hashtag, but you can also always tag us too. And for those of you who want to share, to create a sense of accountability by letting people know you’re doing the challenge, or to encourage others to join you, you can use this image to ‘announce’ it to your friends on social (because sometimes a little accountability and a little community goes a long way!). WELCOME TO THE SUMMER OF PERMA. Let us know in the comments if you’re in and what you’re putting on your list! And as always, subscribe to get new posts right to your inbox. 15 responses on "The Summer of PERMA: a wyg coping challenge"
I love the challenge and your approach to grief is refreshing. I’m a Bereavement Coordinator with a hospice and I come across so many “HELPS” but most are so stale, stagnant and crappy, your word not mine, okay, I’ll own it. I want to use what I find here with the folks I work with. Great resource for coping ideas! I was just talking to a friend who has teen daughter struggling to cope with the uncertainty and set-backs of a chronic illness. I love how this can really apply to anyone who wants help dealing with a challenge. My daughter died 4/25/17. Yes just a year. I will give this a try. I just finished up with my grief support group so a good time for a new challenge. Btw I have no peace with the way she died. It keeps me awake at night. Her husband took his life and her life also. My God I still can’t believe it. My daughter died 7 weeks ago. I’ve been grieving so hard the last few days and don’t want to leave the house. I have help w rent and that ends after July. 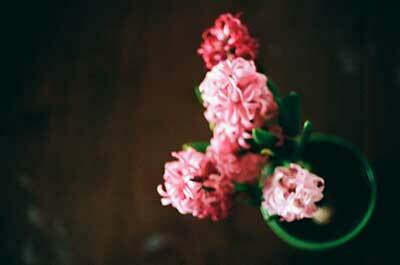 I am immobilized with worry. I have been trying to do ‘fun’ things although it feels very hard to allow myself any kind of joy. I have started working with shatterproof.org and that is keeping me very busy as is planning my own fundraiser- but I typically can’t leave the house till two or three or later if at all. This challenge sounds amazing. I like the different aspects of it and it’s not all about being happy happy happy it’s just about being. I’m so glad I found this site today! Thank you. IN…. and I am going to forward the Challenge to all the members of my Grief Support Group. Thanks and good luck to all who accept the challenge. I’m ready to try PERMA. My husband died 6 months ago. I thought I wouldn’t last long without him, but I’m still here, so I guess I’d better start working on some coping skills. It’s noon and I’ve already had three good cries. I know there’s a chance this will lead to depression, so I need to shake things up a bit. I’ve did a gratitude journal years ago after a bad accident and it helped. (I do have a lot to be grateful for) I think today I’ll start one again, for my first day of the PERMA challenge. I’m going to give it a go but I’m terrible at this stuff and I’m so skeptical. If you can keep me going then you will be a miracle worker. Hope died 3/10/10 but sometimes that feels like an hour ago. I’m in! It turns out I started yesterday when I listened to several episodes of Carpool Karaoke on YouTube while running errands. It really brightened my afternoon and had me cracking up, even though I had seen and heard them all before. If you need a laugh the Bruno Mars one will have you in stitches. I love this! My son died 8 years ago & his birthday is this week. I started “Connor’s Birthday Kids” at a nonprofit center & just finished my 10th party. I won’t start again until September so this PERMA challenge comes along at a good time. Thanks & love the list! It’s been only six weeks since my husband, who is everything to me, left me to find his peace. I will be taking this challenge. Some of them I have already been doing. I went to the veteran’s cemetary yesterday for the first time since the funeral and witnessed the gravestone being put up…. I am ready to take on PERMA and add it to all the compendium of self-help activities I offer myself. My husband died eighteen months ago. It’s his birthday this week. There’s a lot for me to deal wIth and prompts and suggestions are one way forward. Yes, rainbows and butterflies don’t work.